Snakes crawling out of the wall might not necessarily be your idea of a beautiful art exhibition, but it will certainly get your attention, and in some of these glimmering, scaly works, you will be horrified, but you won’t want to stop looking at them. In her fourth exhibition at this gallery, Frances Goodman, who has earned her reputation for pushing boundaries into the domain of female vanities, goes one step further. The bulk of the work on show is made of commercially produced false fingernails and eyelashes. A restrictive medium, you might think. But no. 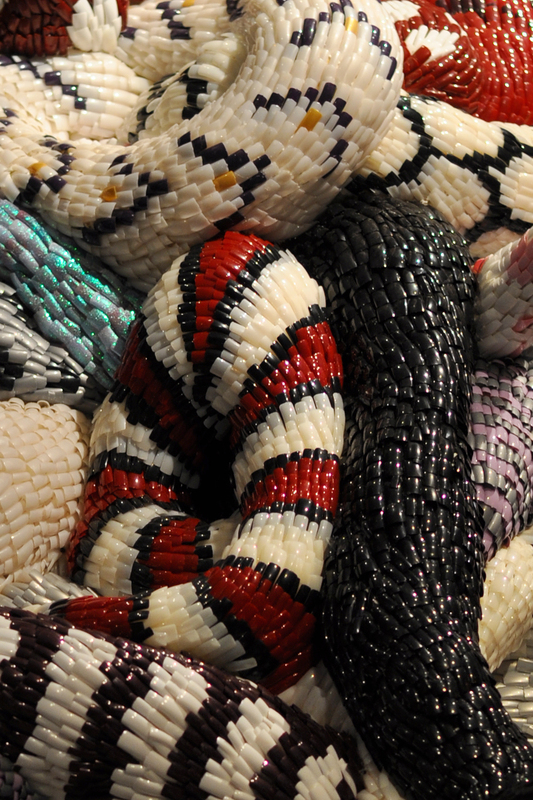 Goodman has glued together millions of synthetic fingernails to form the salaciously creepy snakes that are central to several of the pieces on show. Creeping out of walls, knotted slimily together, they’re patterned, they’re scaly, they’re imminently shocking to the senses. You would jump out of your skin if one of these works moved; on a logical level you wouldn’t be surprised. But the exhibition is not reptilian in focus. Rather, its underlying thread is that of excess and erotica and in commenting on how women adorn themselves, Goodman has created something that is both compelling and repelling at the same time. A work called Ophiophillia is a veritable nest of snakes, all wriggling together. In another work, called Lacquered Up, comprising red fingernails, blood is evoked, gushing and haemorrhaging from a pipe in the wall. Less successful pieces comprising glossy parts of cars, great big slices of smooth fibre glass and glittered beads and diamante also feature, but the impact of these pieces is as subtle and developed and a smack on the head with a sledgehammer. But the work doesn’t stop there. In the Jan Smuts Room on the far right of the gallery, Goodman has created a body of close to 60 small ‘drawings’ made of faux eyelashes and glue. Some bear texts, others are more abstract, but the most successful of these curiously compelling pieces evoke the obscure eroticism in a Japanese woodcut tradition, featuring octopi. There’s a tentacle here, a bit of octopus-evoking texture there. The drawings touch and meander through traditions and notions of eroticism, in a creepy, discomforting way. They feel like drawings made of pubic hair, as they embrace wit and sensuousness with a critical edge that’s hard. Nail Her is not a show that kow-tows to a conventional art buyership, but it is certainly art that makes you look, even though it does slip into the crevice of the one-liner: once you’ve seen it and ‘got’ it, you move on. Nail Her, a solo exhibition by Frances Goodman, is at Goodman Gallery in Rosebank until May 31 (011)788-1113. A version of this review appeared first in the SA Jewish Report. Mother of all Eating: satire at its impeccable best.